"Light garnet hue with fruit aromas of wild strawberry, sweet cherry, and plum married with sage, wild thyme and a touch of cedar. The vibrant fruit, savoury notes and intriguing spice, layer wonderfully with the silky fine tannins and creamy texture highlighted by a fresh acidity that gives the wine tremendous energy. The cooler growing season saw a late April/early May harvest resulting in a beautifully fragrant wine with delicate fine tannins and exciting aromatics that are a true reflection of the Waitaki. A wine that is a touch exotic, lithe and exceptionally enjoyable upon release and will benefit from up to 8 years in the cellar. 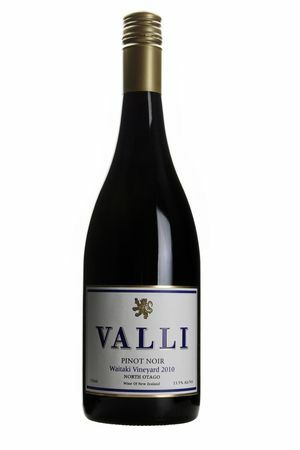 A real gem for those who love Waitaki Pinots!" "Bright garnet hue with fresh red fruit aromas of wild strawberry, sweet cherry, and raspberry with fragrant potpourri and a touch of cedar. The vibrant fruit and intriguing spice layer wonderfully with the silky fine tannins and creamy texture highlighted by an electric acidity that gives the wine tremendous energy. The warmer growing season resulted in an early harvest for the Waitaki, creating a beautifully concentrated wine with a touch more tannin than in cooler years, yet still showcasing all the classic Waitaki features. A wine that is engaging lithe, and fragrant in its youth and will definitely reward cellaring." "Light garnet hue with sweet and savoury aromas of fresh lilac, dried plum, wild strawberry, cumin and manuka-smoked bacon. The charming florals, intriguing spice and red/dried fruit flavours layer wonderfully with the limey acidity that drives the wine and the silky fine tannins that create a beautiful round and mouth-filling texture. Forever ethereal, Waitaki Pinot is unique: bridging the energy of new world pinot noir with the form and shape of classic old world pinot noir. An intriguing wine that is lithe and fragrant in its youth with savoury notes that will continue to unfold with age." "An intriguing fragrance of lilac, rose, strawberries, cassis, and Oolong tea with a hint of smoked bacon. The powerful acid core drives the wine and gives energy to the flavours of red fruit, mulberry, and white pepper. The tannins are intricately fine and give great length to the flavours. This is an ethereal wine that will live long in the moment and also endure the test of time." "The most savoury aromatics of Valli’s four Single Vineyard Pinot Noirs. Dark berry fruit, exotic spice and dried herb notes with complexity from toasted barrels as well as the region’s earthy mineral notes. Dense, silky textured and with concentration not previously seen in the Waitaki. This vintage shows darker, more brooding berry fruits, yet still retains savoury mineral notes, flavour-carrying acidity and lovely gentle tannins. Often not picked until mid-May in this cooler climate, it is easy to see the benefit of a very long hang time." "The most savoury aromatics of Valli’s three Pinot Noirs. Sweet earth and white pine mushroom, with some pretty floral, dried herb notes and red berry fruit in background. Often not picked until mid-May in this cooler climate, the grapes benefit from a very long hang time producing wines with fine tannins, incredible length and a chef’s dream firm acid backbone." "Nose: Very open and perfumed aromatics, raspberry fruit with dusty/earthy herb notes in the background. Palate: Waitaki Pinot Noirs are not about impact or density, they are “lightness of being.” This wine has clear acidity which keeps the wine light on the palate but delivers great length, carrying raspberry fruit flavours and minerality on for what seems like forever."